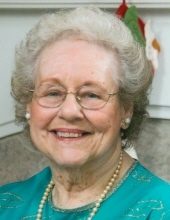 Mary Louise (Mullen) Peters, 96, passed away peacefully on April 13, 2019 at Heritage Health Chillicothe. Mary was born in Peoria on July 27, 1922 to Henry and Dorothy Mullen. She married Francis Peters on November 14, 1946, and they were happily married for 66 years before he passed in 2012. She is survived by her daughters Kathy Burt, Barb Hartter, Chris (Fred) Girardini, Doe (Bob) Grant, 10 grandchildren and 16 great grandchildren. She was a loving wife, mother and grandmother and we will all miss her beautiful smile. She was preceded in death by her husband, son Tom, her sister Pauline Stubbs and two sons-in-law Rick Hartter and Chuck Burt. In keeping with her wishes, funeral services are private and for immediate family only. Those wishing to honor her life can make a donation in her name to St Jude Hospital Midwest Affiliate. To send flowers or a remembrance gift to the family of Mary Louise Peters, please visit our Tribute Store. "Email Address" would like to share the life celebration of Mary Louise Peters. Click on the "link" to go to share a favorite memory or leave a condolence message for the family.